We’re a diversified wellness chiropractic office, offering innovative and creative chiropractic care. We believe optimal health is achieved through physical, chemical and emotional balance. Every person is different. Therefore, we treat you as a unique individual as you discover your best health. Paperwork - Upon entering the office, we take care of any necessary paperwork for you to fill out. We’ve made our paperwork available here so you can bring it with you completed to your visit to save time. History and examination - Dr. Ebadat will ask you various questions related to your health and tell you a little about the services we offer. Next, a number of specialized tests will be performed and X-rays will be taken when necessary. Treatment - Most often, you will be given some form of care during this same visit. This care may include spinal adjustments, physical therapies and soft tissue therapies if you’re in pain. Ideally, you’ll receive your first adjustment on your next visit. We’ll schedule a convenient time for your follow-up visit. Generally we like to schedule this within one to two days of your first visit. 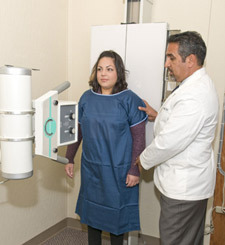 When you’re here, we’ll provide you with our complete review of findings and X-rays when appropriate. We’ll discuss your treatment options and you’ll receive an adjustment. You may be given an x-ray if necessary. We want to see you get well fast and stay well. We’ll recommend what we think an appropriate care plan is for you so that you can heal quickly knowing what to expect. To help with your healing, you’ll be given instructions on certain activities or procedures to be conducted at home. These may include ice or heat application instructions as well as home exercises or stretches. Ready to live your best life? Let us help you enjoy optimal health! Call (408) 244-6555 to schedule an appointment today!